This actually started in #joiito a couple of weeks ago after the Eric published the spoofing attack paper. 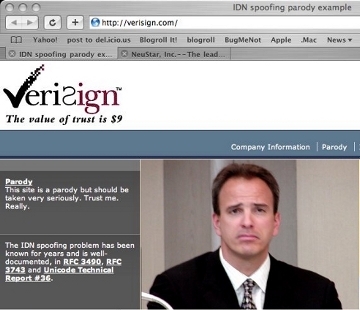 A joke was made that it would be funny if someone did it to verisign.com and so he did. I suppose I could rant why VeriSign should adopt the JET Guideline (or ICANN Guidelines) but this parody would send a louder message. Also check out Neustar website, the competitor to VeriSign. 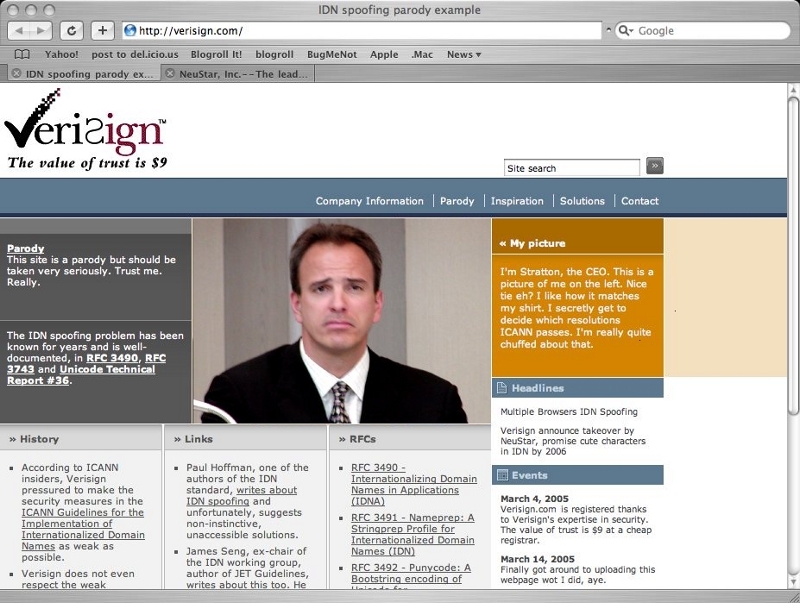 Nevertheless, I am sure the folks in VeriSign will react to this quickly. The second is how to deal with the parody site - VeriSign isn't know to have a great sense of humor so I fear for my friend - I have taken the liberty to speak to Wendy from EFF just in case. IANAL but the only thing I could see VeriSign has a case on is the domain name itself (verisign.com) which is their trademark. The rest of the site have been made clear it is a parody - adapted from Neustar, who apparently has a great time laughing at the parody - or modified from Verisign in such a way no one would be 'reasonably' confused. They could get their army of lawyers to send threatening letters to Rischard to take it down - but that would only be PR disaster for them and would further attract more attention to the site. Or alternatively, they could just send a polite email to Rischard to ask him to take it down - Rischard is doing this for a laugh, not looking for a fight so he might after all. Local Time: Friday, April 19, 2019 01:49 PM PDT – Page Load: 0.3881 Sec.